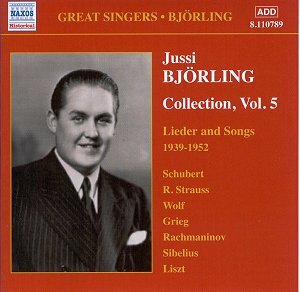 The fifth Bj�rling volume covers a period between the last months before the Second War and the tenor�s early LP disc LM 1771. There are eight 78 sides � four discs from 1939-40 � and the remainder of this recital derives from that April 1952 LP. The long-ish gap did see some inevitable deterioration in the freshness and immediacy of vocal production and the later discs saw him revisiting a few earlier sides so there is repertoire duplication. But what may have been slightly lost with age in terms of beauty of sound was compensated for in a deepening of emotive response. In interpretative terms I tend to prefer the post-War sides whilst acknowledging that in terms simply of sound Bj�rling�s earlier self remains non-pareil. The repertoire divides fairly evenly into Schubert, Strauss and Scandinavian � with single examples of his Beethoven, Brahms, Rachmaninov, Liszt and Wolf. The songs are essentially canonic though his responses are never prosaic or intimidated. He�s full of light, lyric ease in Strauss�s Morgen whilst the voice deepens and darkens appropriately in C�cilie - though the admixture of pleading manliness is ever-present. It made for a very apposite disc, the one side full of grace, the reverse side needy and more urgent. We hear with his Adelaide those qualities of mezza voce, floated with distinction, and intimacy that are so powerful a component of the Bj�rling vocal armoury. There is no doubting the technique, nor the exquisite delicacy employed � though as an interpretation one needs to note that it remains rather neutral. The same is true of his Schubert; the singing is touching, warm, yielding, and full of differing shades and colours � but it�s arguable if Bj�rling here ever quite gets to the interpretative heart of the matter in these, of all, songs. The 1940 recording of Sibelius strongly highlights the sibilants, sometimes to distracting effect, but the performances are powerfully projected and mature, especially Svarta rosor and the desolation of the last bars of S�v, s�v, susa. His Grieg and Sibelius are of course high water marks of this, or any, set but in the 1952 recordings we can hear a slight lack of athleticism in Strauss� St�ndchen and in the re-make of Morgen a rather heavier, less fresh tone. But he can certainly fine down that tone, as he does in his classic reading of Sj�rberg�s Tonerna and there�s still plenty of steel left for Schubert�s Die Allmacht in this stentorian reading. There�s a hint of constriction in the voice in the Liszt and the sound here is certainly not as freely produced as was the case thirteen or so years earlier but as an example of a greater harvest of emotive depth in the face of encroaching limitations one can do no better than turn to Schubert�s St�ndchen. The losses in terms of tonal luminescence are richly compensated for in respect of a greater depth of engagement, a more powerful alignment with the truth and textual illumination of the lieder singer�s art. The notes are fine and helpful. The transfers retain a degree of surface noise and in the earlier 78s at least a trace of that metallic quality that could afflict some vocal recordings if not properly tamed. The LP transfer is good and in the main you won�t be disappointed.